This e-newsletter is sent to HKIRA members and subscribers. If this email does not display correctly, please click here to view in your browser. 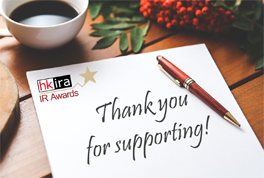 The HKIRA 2nd IR Awards 2016 could not be completed so successfully without the support of our sponsors, conference speakers, judging panel, nominators, voters, and every Hong Kong-listed companies. This year, the response has been encouraging, with an average growth of at least 60% in terms of nominations and voting. 160 listed companies confirmed participation. Over 660 eligible voters have cast an aggregate of over 7,000 votes for their best choices of IR professionals and companies. HKIRA is grateful for the continued support from all of you. 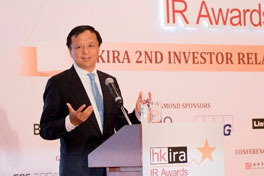 Guest of Honor and keynote speaker Mr. Charles Li, Chief Executive of HKEX. 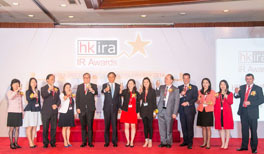 Toasting by HKIRA Exco members and IR Awards Panel Judges. 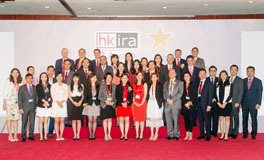 Awards winners took group photo with HKIRA Exco members and IR Awards Panel Judges. For the complete list of winners, please visit the Awards website. 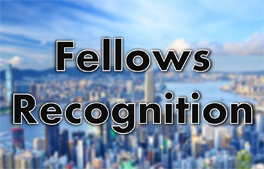 HKIRA has launched the HKIRA Fellows Recognition Program to distinguish senior members who epitomize expertise, experience, and contributions to HKIRA and the investor relations industry in Hong Kong. These individuals have made contributions to the betterment of the profession and HKIRA throughout their careers. To learn more, visit our website. Offering education and training is one of our visions. Since 2012, HKIRA has been in partnership with the UK IR Society to provide the Certificate in IR. The qualification ensures an appropriate level of knowledge about regulatory compliance, financial and capital markets. Learn more about the CIR and consider its importance for your career today! 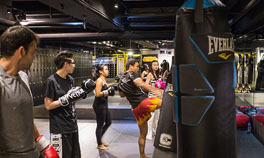 Let's try some boxing that can enhance flexibility and relieves stress! Seminar "Introduction to Investor Relations for IR Personnel"
Nine Dragons Paper (Holdings) Limited is hiring Investor Relations Executive. For more details, visit our website. Posted since 24 Jun 2016. Arranged in alphabetical order of family names. 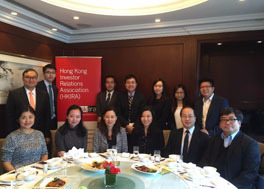 0392 Beijing Enterprises Holdings Ltd.
Hong Kong Investor Relations Association (HKIRA is a professional association comprising IR practitioners and corporate executives responsible for communications between corporate management and the investment community. 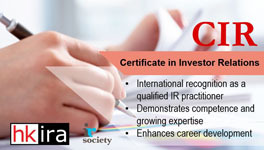 Established in 2008, HKIRA advocates the setting of international standards in IR education, promotes best IR practices and strives to meet the professional development needs of those interested in pursuing the investor relations profession. HKIRA is dedicated to advancing the practice of IR as well as the professional competency and status of our members. To date, HKIRA has over 500 members and most of them are working for companies primarily listed on the Hong Kong Stock Exchange. HKIRA's membership profile covers a wide spectrum of professions from IR, finance, accounting, company secretarial to corporate investment roles. It consists of executives at various stages of their career, including the top executives from the IR professional and also the C-level management of listed companies. To unsubscribe, please send an email to info@hkira.com with "REMOVE ME" as the subject of your message.